NOTE: Tagliatelle pastas are long, flat ribbons that are similar in shape to fettuccine and are typically about 6.5 mm to 10 mm (0.25 to 0.375 inch) wide. Tagliatelle pastas are usually made from egg and can be served with a variety of sauces, though the classic is a meat sauce or Bolognese sauce. Snap the woody bottoms off the asparagus stalks and throw them away. Cut off the top 4cm of each stalk, put to one side and finely chop the remaining stalks. 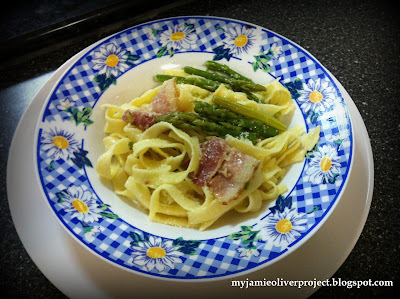 Heat a wide frying pan and gently fry the chopped asparagus stalks in a little olive oil with the pancetta. When the asparagus softens slightly turn the heat off and mash them roughly with the back of a fork. Cook the tagliatelle in plenty of boiling salted water, according to pack instructions. Add the asparagus tips for the last 2 minutes of cooking time. Drain the pasta, reserving a cup of the cooking water, and toss with the mashed asparagus and pancetta. Stir in most of the Parmesan cheese and season with salt and pepper. If needed loosen the pasta with a little of the cooking water. 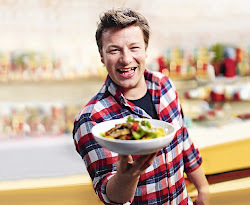 Serve with the last of the Parmesan sprinkled on top. 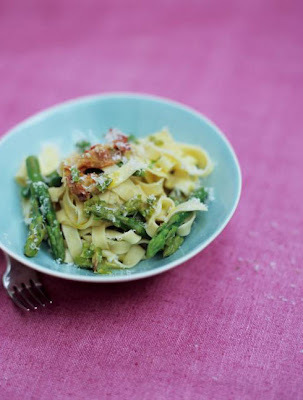 Tip: Cooking your asparagus with the pasta is a clever way to save on time and washing up.